Short two characters, Agents of SHIELD renews its focus on people and story lines that have been a little short-changed this half-season, expanding its current cast’s personal lives and trying out some new team-ups and interpersonal dynamics. Also, sociopolitical commentary! And they say comic book shows are just popcorn TV. You can click here to join the conversation at TMS or hit the jump to read on. Mack’s family fun time gets cut short when The Watchdogs, a, er … human supremacist group? non-super-powered supremacist group? … turns from trolling to terrorism, using modified Stark tech called “nitramene” (oh hai, Agent Carter reference!) to implode an ATCU building. Suspecting they got the tech from off-the-grid SHIELD agent Felix Blake (remember him? ’cause I sure didn’t! 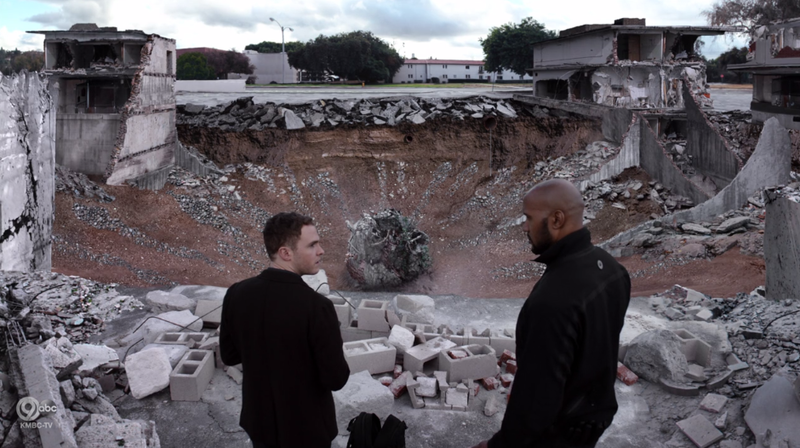 ), Coulson has Daisy and Fitz meet up with Mack to investigate the crime scene while he tries to locate Blake. Despite Mack’s disagreements about her methods (more on that later), he rendezvous with her and Fitz at The Watchdog compound. Things take a turn when Mack’s li’l bro Ruben (Gaius Charles) shows up for the night’s rally. 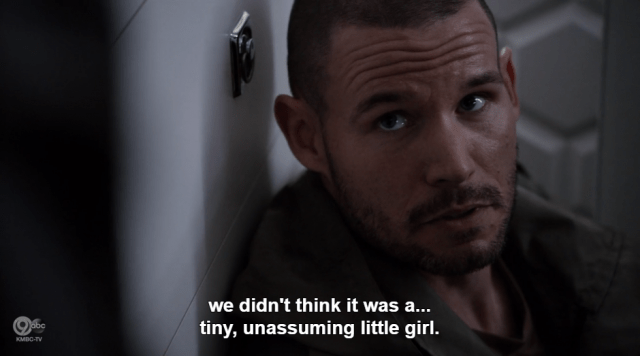 Mack orders a retreat, Daisy goes after Blake anyway, and it almost gets Fitz imploded. They figure out how to save him thanks to a captured guard, who also informs them that The Watchdogs decided Mack was the group’s big bad Inhuman and are planning to kill him. Oh goody, sexism and racism! These supremacists read their American terrorist handbook, all right. With their house under siege, Mack saves his brother’s life and regains his trust by wiping the floor with these militant asshats. 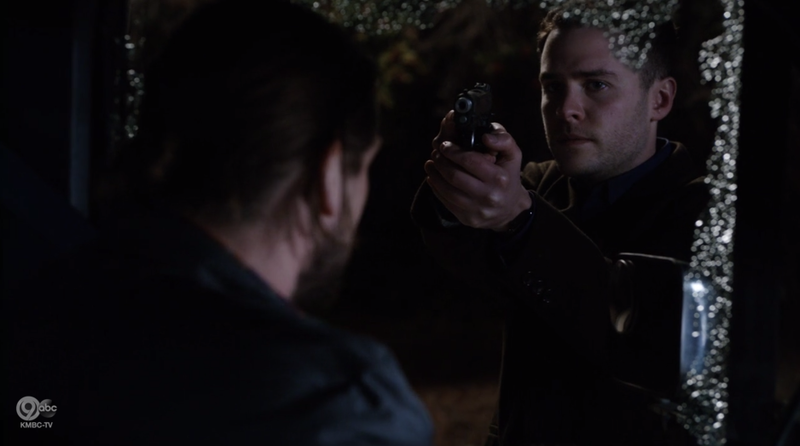 And did anyone else get ridiculously excited when he pulled out the family shotgun? Because all I could think was “We’re halfway there! Fulfill the prophecy, Mack!” AND THEN HE DID. I mean, technically it’s a shotgun cleaver, but dude just got shot so I’m gonna give him this one. 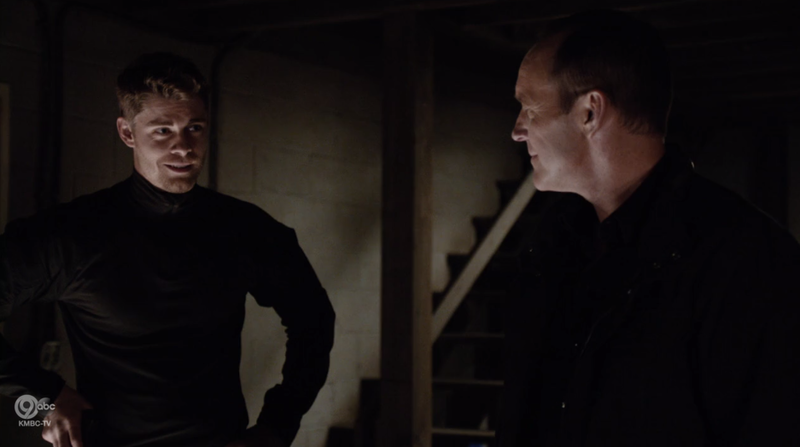 Meanwhile, Coulson’s not pleased with Lincoln’s evaluation (he’s here for Daisy, he has control issues, he tends to ignore orders), but his list of spies is running low, so he takes Lincoln on a recon mission to vet him personally. They run into a Blake-hologram who makes some, uh … pretty cogent points about SHIELD’s tendency to create a lot of the problems it later fixes, actually. But he also spews a lot of xenophobic hate speech about “freaks,” even referring to Coulson as one, so it’s hard to take his arguments seriously. Yeah, Phil! How dare you be raised from the dead against your will and lose your hand saving the world from a different group of extremists! Coulson tests Lincoln’s control issues by ordering him to not control himself. This seems flawed to me, but it does tell us what Coulson looks for in an agent: A willingness to voice dissent coupled with an ability to follow commands without violating one’s own code of ethics. That Lincoln doesn’t deliver a kill-shot might be the biggest point in his favor, and point to a growing desire to protect rather than just destroy. And back at base, Simmons is sick of having to rely on others in combat situations (especially that one time she unleashed Andrew and he murdered a bunch of folks) and decides to work on her marksmanship. May sympathizes and channels that guilt, having Simmons use her Powers O’ Deduction to help her track Andrew. Simmons thinks their vaccine might work on him since he hasn’t finished his transition yet, but May can’t afford to hope again and plans to kill him regardless. I remember the shots of them in Maui and my heart breaks a little bit more. 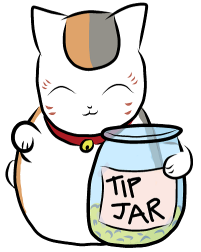 Oh, and P.S. : Malick is working hand-in-hand with Blake, using The Watchdogs’ anger and hate to point them at targets he needs destroyed for his own schemes. They recovered some kind of missile or capsule from the attacked ATCU base. So, yeah, the politically powerful billionaire is riling up the angry, frightened masses to further his own ends. ‘MURICA! That said, by the end of the episode, it’s clear The Watchdogs are not the freedom fighters Rubin wanted them to be. They’re supremacists, prone to fear and hate not just “freaks” (BOOOO) but anyone different from themselves. The series makes some quiet but smart statements through its characters and casting here, as The Watchdogs are overwhelmingly young white men and assume that (1) their target can’t possibly be a woman, and (2) their target must be the one POC on the SHIELD team. This speaks to deeply ingrained issues of insecurity and prejudice. It also alienates groups of people who (like Rubin) might be sympathetic to their cause, clouding over the few relevant arguments (like government transparency) with wanton rage and destruction. Then there’s also the tangled question of our agents’ roles in all this, and how best to combat violence and hatred. SHIELD are the government organization—the peacekeeping force, part of that rigged system Rubin accuses—but Daisy and Lincoln are also part of the group that’s being targeted. Mack argues for the high road, that “it’s not about how they act; it’s about how we respond,” and while I agree with him in the broad abstract, I also understand that’s a lot harder to do when there’s a bunch of people who want you dead or captured simply for being who you are. Rational or not, true or not, people on both sides feel as if they’re being attacked or at least threatened, and that leads to the chain of violence that occurs this week. More transparency—a greater sharing of knowledge with the general public about the Inhumans, so they come to understand they’re (as Mack keeps repeating) people, too—might be the best way to combat it. 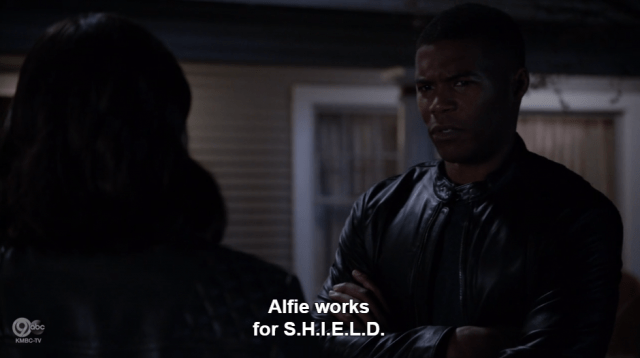 But SHIELD is nothing if not intent on keeping its secrets, a fact that almost destroys Mack’s relationship with his brother this week. That’s highly sensitive and classified information, but Rubin pinkie promised not to tell anybody, so it’s all good. Big Ideas aside, I love that we’re getting to see more of the cast’s personal lives. One of the issues with the early episodes was that we knew nothing about them outside of their jobs, which made it harder to see them as real people instead of just agents. This half-season began with an understanding that a life outside of SHIELD is important for our team, and more exploration of those lives will help to forward that message. Also … geez, I already miss Bobbi and Hunter. They injected the show with a lot of its spy caper fun and snappy banter, and things are about 80% less amusing and witty with them out of the picture. Other characters have the capacity for humor and fun, but they’re all working through so many personal issues they don’t really have time to snark right now. Hopefully they can either work that back into our current cast’s interactions, or add a few Secret Warriors to do it instead. I mean, Joey should be back from his own family fun times soon, right? 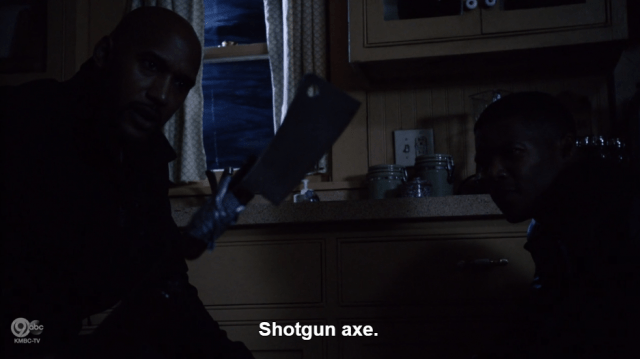 Still grinning about the shotgun-axe combination, TBH. Despite all my jabs, I don’t actually hate or even dislike Lincoln these days—I really just have no opinion about him whatsoever. The writers are doing their damnedest to give him layers and make him interesting, but Mitchell plays him with such one-note dourness that it’s hard for me to feel for him even when, on paper, I should. “Have you been working out? ‘Cause it weighs, like, 100,000 tons. It’s a building.” “So…no, then?” Mack and Fitz science-ing and bantering together again is a truly beautiful thing.